Waffles Anyone? ~ Learn, Live, and Explore! My friend claims he makes some of the best waffles around - and I have to agree. 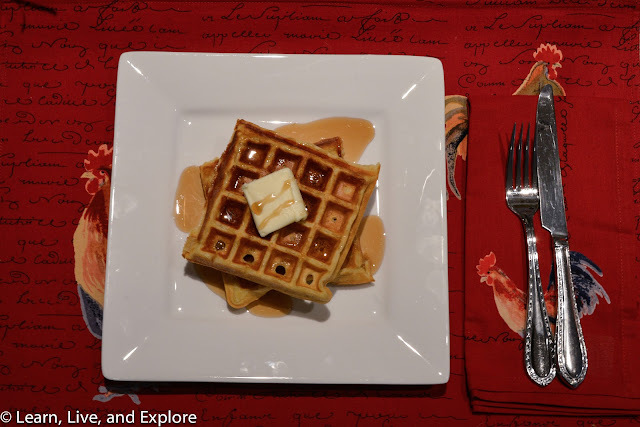 The recipe is a bit more complicated than a basic Belgian waffle recipe, and it's definitely not diet friendly, but if you're up for the challenge and calories, then you should give this recipe a try! 1. In a bowl, sift the flour, baking powder, baking soda, salt, and sugar together. Set aside. 2. In a large bowl, whisk together the egg yolks, butter (cooled slightly so as to not curdle the eggs or buttermilk), buttermilk, and vanilla. 3. Stir in the flour mixture into the wet mixture. 4. In a stand mixer with the whisk attachment or in a bowl with a hand mixer, whip the egg whites until stiff, but not dry. 5. Fold in 1 cup of the egg whites into the batter. Then fold in the rest of the egg whites. 6. Cook in a waffle iron based on the specific directions for your appliance. 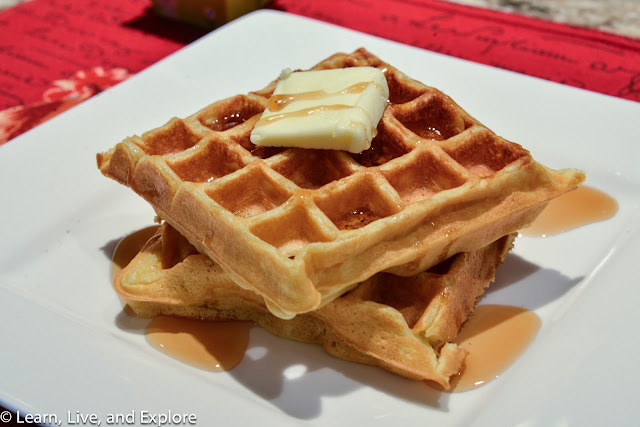 Of course you can top the waffle with traditional butter and syrup, which is my favorite, but if you're up for a delicious adventure, use some Biscoff cookie spread on your waffle for a gingerbread/graham flavor that tastes great. You won't regret it! Or sauté some apples with cinnamon, sugar, and butter. YUM!